The true power of Targetprocess is flexibility. You can create lots of custom views showing user stories and bugs, features, test cases, requests, impediments, users, projects and teams. Countless combinations of cards, lanes and filters are available. To create a new view, click the + Create button, then select Board, List, or Timeline option at the bottom of the left menu in Targetprocess. Available view modes are described in The Views and Tools Overview article and How Visualize: Board, List or Timeline? blog post. Set up view screen appears. On Templates tab you will see a template choice. You can find applicable template and apply it. 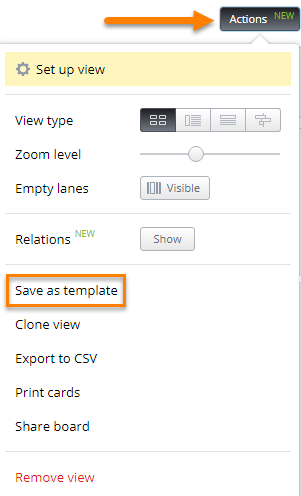 It is also possible to save an existing view as a template and then apply the saved template to your newly created view. It is useful when your aim is to apply already existing filters and design of cards to new views. In an existing view, press Actions > Save as template. 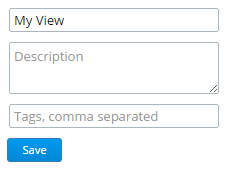 Then input name, description and tags of your new template. Press Save. As a result, new template for your view appears in the Templates tab. Click it to apply the template to newly created views. Or you can click Blank and setup new view from scratch. Here you can select cards, horizontal and vertical lanes, and apply filters to cards and lanes. Here is how the view setup looks with settings adjusted. This view is basic. It shows user stories from the current iteration (note the ?Iteration is Current filter) grouped by states and priority. So you can see whether people work on important stories or not. To help you get started, we designed the Solutions Gallery, a place where you can find different solutions - or collections of views - to satisfy a particular use case. The solution which best fits your requirements can be applied to your Targetprocess account with just one click. To browse the Solutions Gallery, click on the + Create button at the bottom of the left menu in Targetprocess and then select Browse Solutions Gallery. All users are allowed to create new private and shared views by default. However account Administator my decide to maintain views for all users by himself and prohibit users from creation of their own views in the system. No New Boards mashup (add-on) is helpful in this case. When the mashup is installed and activated, + Create button becomes hidden for users with selected numeric IDs or roles.